Return land transfer, English speaking guide, 2 night Twin Sharing Bedroom (A/C), entrance fee, local bites, breakfast * 1, lunch * 2, dinner * 1. Described by WWF as ’the best-managed edible birds’ nest cave in the world’, Gomantong Caves in the heartland of the Gomantong Rainforest Reserve have been the focus for birds’ nests for centuries. 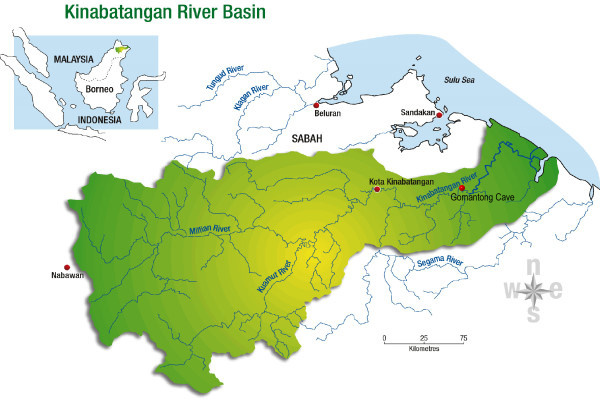 Stretching 560 km from the Crocker Range in the southwest of Sabah to the Sulu Sea in the east, the Kinabatangan River is the longest river in Sabah, sustains one of the world’s richest ecosystems. The surrounding areas along the river consist of five distinct habitats - dipterocarp or dry, waterlogged and limestone forests, and freshwater and saline swamps. The lower basin of the river itself is the largest forest covered floodplain in Malaysia and has the largest concentration of wildlife in the South East Asian region. Other than being home to Borneo’s indigenous orang utan and proboscis monkey, the surrounding forest is also one of only two known places in the world where 10 species of primates namely Proboscis monkeys, langurs, macaques, orang utan, slow loris, western tarsier are found. All the 8 species of hornbill such as Rhinoceros Hornbill, Pied Hornbill, Black Hornbill, Helmeted Hornbill (50kg, 120cm) also found in Borneo make the area their home. Besides, there are many more wildlife found, eg. kingfishers, bubuls, trogons, flycatchers, sunbirds, broadbills, herons, mangrove snakes, vipers, estuarine crocodile, asian elephants and etc. A trip up the river at dawn or dusk is the best opportunity to see the wildlife. You might even sight an Asian elephant or a Sumatran rhinoceros wandering through the trees. Optional tours can be arranged for night safaris as well to spot crocodiles, birds and nocturnal animals. Night walk can be arranged, takes about 1.5 hour, pay locally at MYR10 per person. Tree planting also can be arranged, pay locally at MYR10 per tree. Pick up from hotel and drive overland (2 hrs) to the Gomantong Cave. Reached Gomantong Cave, exploring the cave. Drive onwards to Bilit, Kinabatangan River. Upon arrival, a warm welcome by the staff. Check-in to your room. Lunch at lodge dining hall. Take an afternoon cruise along the Kinabatangan River where you can observe wildlife on the boat. Finish cruising, back to room for a rest / shower. Dinner and overnight at Bilit Adventure Lodge. Recommend to bring : raincoat (wet season Nov - Feb), cap/hat, insect repellent, sun cream, good walking shoes, socks, a pair of sandals, torch, comfortable cotton T-shirt, coat, binocular, camera, personal toiletries and medications. Leech socks and gumboot are available for rent at MYR 10. Camera fee is not included. Special tip : Birds’ nest collecting is done usually between February and August. An optional Night Walk can be arranged and pay locally at the lodge. A guided jungle walk in the late morning for wildlife sighting. Trek back to the lodge. Reach lodge to freshen up. You may meet leeches in the jungle, please wear on leech socks, you may rent it from the counter. Transfer back to hotel / airport. Estimated arrival time at Sandakan city.